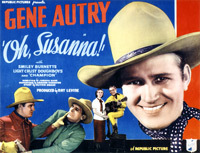 GeneAutry.com: Film Info - Oh, Susanna! Killer Wolf Benson escapes from a sheriff's posse by getting on a passenger train as it enters a tunnel. Realizing that the train will be searched at the next stop, he enters the stateroom of radio star Gene Autry, knocks him unconscious, changes clothes with him, and then hurls Gene's limp form out the window. Benson escapes with Gene's luggage while Gene is picked up by roving troubadour actors Frog Millhouse and Professor Daniels. When Gene, in the garb of Benson, tries to explain to authorities, he is jailed and ordered to be hanged the next day. Frog and the Professor obtain his release through trickery with a Gene Autry recording. Meanwhile, Benson, guided by a telegram he found in Gene's belongings, arrives at Jefferson Lee's dude ranch passing as Gene, an old friend. When Lee sees through the ruse, he is promptly killed and robbed of several thousand dollars. 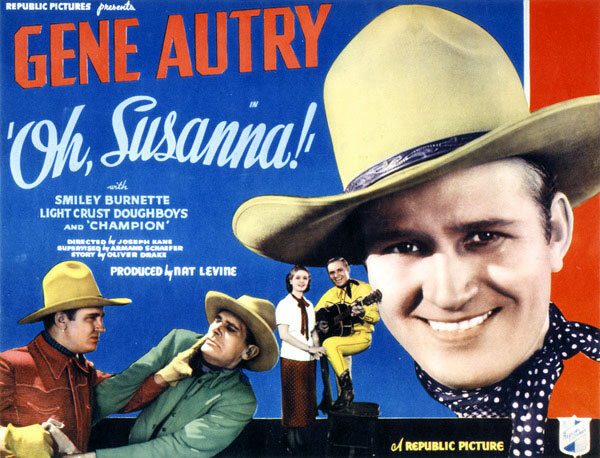 The family, including Lee's daughter Mary Ann, in charge of ranch entertainment, offer a "Dead or Alive" reward for Gene Autry. The real Gene finally arrives at the ranch and, with Frog, the Professor, and the Light Crust Doughboys, entertains guests. At the same time he does a bit of sleuthing, tracking down Benson, and clearing his own name. Sheriff Cole Ed Peil, Sr.